We stand behind the quality of our products and want to make sure our customers are completely satisfied. 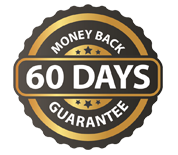 Your satisfaction with our products is completely guaranteed for a full 60 days from the date of purchase. If you are not completely satisfied, simply write a brief explanation of your negative experience with the product to support@royalpotion.com and write “Refund Request” in the subject line. We will then be happy to issue a full refund.